This is a brief update for those of you who are following the current War in Yemen. Note that the US has pulled all troops from Yemen and closed the embassy. I feel that the US is letting the people who have a horse in the race fight it out - appropriately. There is nothing in Yemen for Americans to get hurt over. I don't like Yemen the country. It's people are evil and small. Watching a family put it's 10 year old son in a knife fight with another 10 year old in a neighborhood arena for the purpose of recreational gambling is a national pastime. Sometimes it's a girl who has "dishonored the family" that's put into the neighborhood arena with half a dozen starved feral dogs that tear her to pieces and eat her viscera (guts) while the people bet on how long it will take for her to die. Just when you thought that a "Class 4 latrine" is as low as you can go, you go to Yemen and discover that there is a "Class 5 latrine" and you're in it. Iran sponsors the Houthi movement in Yemen. 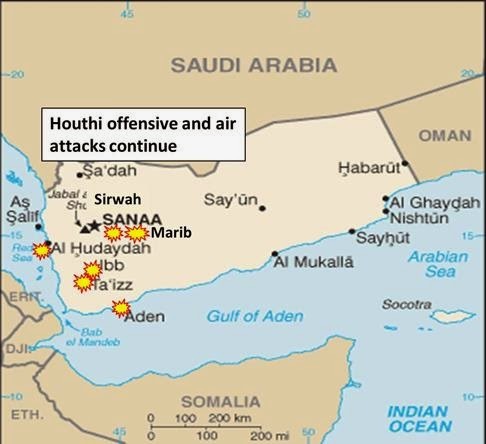 Their goal is to gain a foothold in Yemen that will allow them to close the Bab el Mandeb (note map above). Once accomplished they can stop Saudi Arabia from shipping oil from there to the rest of the world. There is already a heavy Iranian military presence at the Straights of Hormuz (on the other side of Saudi Arabia) that can close that waterway. The Iranians feel confident that they can destroy the Suez Canal with a nuclear weapon or use aerial mines to close it to shipping. The security situation has worsened in Yemen in several respects. The Houthis have pressed their southern offensive and showed no signs of withdrawing. Saudi and Coalition air attacks increased to try to stop the Houthis. News sources reported air attacks in at least six locations including the ports of Hudaydah and Aden. Houthi militias continued to push east of Sana’a towards Marib. Coalition ships shelled Houthi positions in Aden. One local news source reported the arrival at the border of the first of the Saudi National Guard battalions. Opposing forces at the border north of Sa’dah exchanged artillery and mortar fire again. Pakistani newspapers reported that Prime Minister Sharif, General Sharif and Minister of Defence Khawaja Asif had lunch with Saudi King Salman on April 23rd. Pakistani leaders told Saudi King Salman Pakistan does not want to send ground troops in to Yemen to enforce their claims. One commentator wrote that the Saudis would exert heavy pressure on Pakistan by means of incentives, including cash, oil on deferred payment, purchases of weapons and other incentives. The Pakistani delegation might have no choice but to offer one division of paramilitary soldiers drawn from the Pakistan Rangers and the Frontier Corps, with some Pakistan Army troops. Prior to the visit by Chinese President Xi Jinping, the Pakistanis had little leverage for resisting the Saudi demand for regular combat forces. China’s development assistance seems to have given them the fortitude to refuse the Saudi request. Chinese projects represent a long term vision for Pakistani development, whereas the Saudis offer help to Pakistan in the present and the immediate future. Ultimately, the Pakistanis will find a solution that allows them to save face, while honoring the Saudi request. One suggestion is that Pakistani troops might replace Saudi military personnel along the border with Iraq, freeing the Saudis for Yemen operations. We should drill for oil and build our own refineries within the boundaries of the US. The USA/Canada has the largest proven reserves of oil on the planet. The Arabs and Persians can continue their war to decide whether the Sunnis or the Shiia are the REAL inheritors of Mohammed's kingdom. No need for American involvement. If Iran wants to invest in nuclear weapons, we nuke them from Orbit and the only thing of value in Iran (lizards, cockroaches and scorpions) will survive the nuclear holocaust anyway. In a few hundred years when the half-life of the uranium decay has made the place less radioactive, maybe rodents, jackals and vultures can return and populate the place.